The Bridgewater Public Library will present “An American Teacher’s Semester in Thailand” on Tues., October 14th at 7:00p.m. 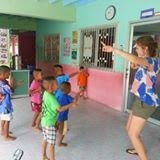 Brianna Torpey, formerly of Bridgewater, will speak about her recent adventures living and working as an English Language Teacher in Thung Song, located in the province of Nakhon Si Thammarati. Her position in Thailand was administered by the AYC Intercultural Program and lasted six months. Brianna will present a power point lecture focusing on her adjustment to Thai culture, what it meant to be an English teacher in Thailand, what she learned from her experience, and why she can’t wait to return as a visitor. Brianna is currently working as an Academic Advisor at Southern New Hampshire University and is enrolled in a Master’s program there. She is a graduate of Emmanuel College and has studied psychology at NUI Galway (university) in Ireland. This is a free program, sponsored by the Friends of the Bridgewater Public Library. It will be held in the library’s Flora T. Little Meeting Room on the lower level. Parking is available in back of the library, located at 15 South Street.